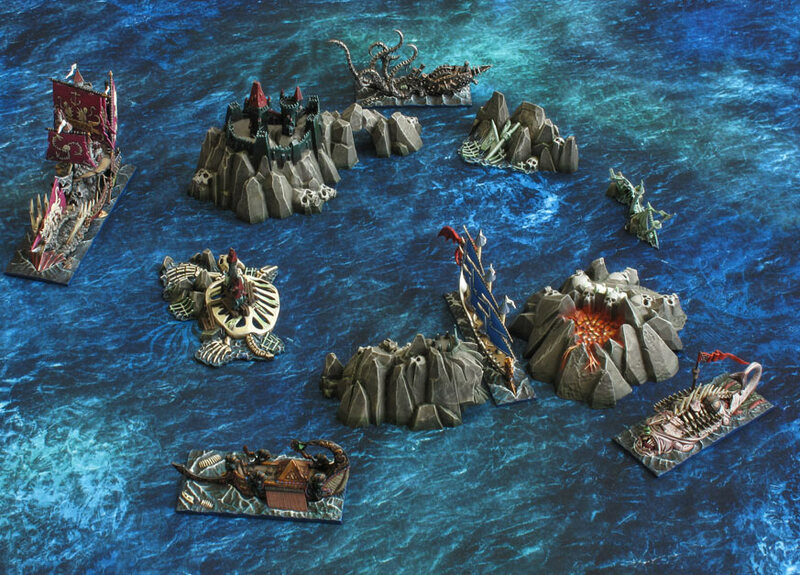 Hephesto's Forge: And even more Dreadfleet info from GW! 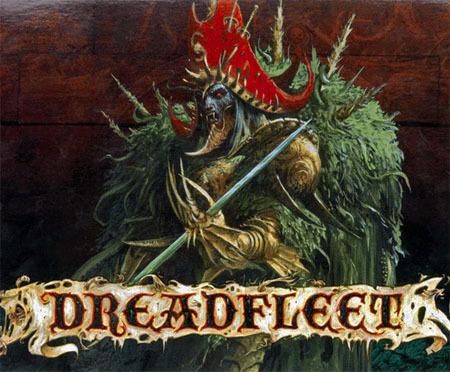 And even more Dreadfleet info from GW! - When ships get damaged the controlling players needs to draw damage cards, these come in roughly four types: speed penalty, special damage (can also turn into something good), crew reduction and hall damage. - Combined with the wind effects and fate cards these add a whole lot of randomness to the game and it seems that specific ships are designed to reduce this randomness in certain fields. 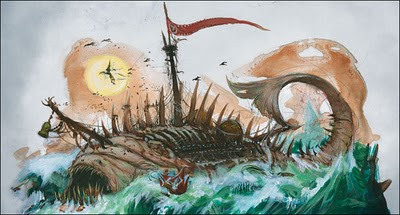 For example Grimnir's Thunder has a flamecannon that forces your opponent to also take an Ablaze cards if it draws a damage card, while the Seadrake's bolt throwers specifically take down the enemy's crew while the Bloody Reaver's captain can prevent randomly appearing seamonsters from turning on ships of the evil, or should that be eviler, side. Regardsless, there still seems to be a lot depending on what cards you draw when your opponents opens up on you. So it seems to me that this will be a very scenario / fluff driven game, which is rather nice for a one-off, somewhat over the top game! Still no way of telling how strongly this randomness will affect actual tactics. - All the little rulers and tools you normally need in a game are all in plastic and will need a lot of work to look even half as good as GW's materials. Not to mention some serious varnishing to make certain the paint will be protected from heavy use. - Pretty much every piece of scenery that comes in the box is also involved in the scenarios of the campaign and will have special rules / evil occupants. - While not a rock-paper-scissor game, it is becoming clearer and clearer that certain ships are clearly stronger against certain opponents while having specific weaknesses that make them very vulnerable to specific other opponents. The Skabras in particular is a great example of this with its warpcannons ignoring heavy armour like that found on Grimnir's Thunder. On the other hand, they have only limited fighting ability, so they would suffer greatly against a fast, anti-crew oriented ship like the Seadrake that will easily keep up with their tendency to run away from a fight. And that does it for this weekend, if all goes well the actual game will be arrive at my local post office tomorrow or tuesday. So actual rules evaluations are almost within reach, can't wait to see how they've really turned out! Although I did not draw much attention to the new GW game, I must say that the entrance is very well written and gives much useful information. Good blog, I'll follow closely.